Right now, we are watching the early rounds of a heavyweight fight between two extremely determined opponents. Occupy Wall Street has no plans of losing this fight and neither do law enforcement authorities. Perhaps those running the show actually believed that raiding Zuccotti Park and more than a dozen other “Occupy camps” around the nation would end these protests, but that is just not going to happen. Whatever your opinion of Occupy Wall Street is, everyone should be able to agree that this is one dedicated bunch. They are absolutely obsessed with their cause and in response to the recent raid on Zuccotti Park organizers are calling for “a national day of direct action” on Thursday. But if Occupy Wall Street protesters want to take things to “the next level”, they should not underestimate the resolve of the police state. Over the past decade, the homeland security apparatus of the federal government has been slowly but surely turning this country into a “Big Brother” police state. Today, our law enforcement authorities are obsessed with watching us, listening to us, tracking us, recording us, and gathering information on all of us. We are constantly reminded that we live in a prison grid (just think about what they do to you before you are allowed on an airplane) and they are not about to put up with anyone challenging their authority or their control. Have you even known parents that constantly feel the need to prove that they are “the boss” of their children? Well, that is essentially what the homeland security apparatus in this country has become. All over the United States, law enforcement personnel are taught that every American is a potential terrorist and they are actually trained to “act tough”, to bark orders at us and to not let anyone question their authority. 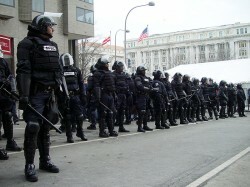 If Occupy Wall Street believes that it can get the police state to “back down”, they are sorely mistaken. Hopefully everyone will cool off a bit as the temperatures go down this winter. But if we do see a “cooling off”, it probably will not last for long. As the U.S. economy continues to get worse, these kinds of protests are going to keep growing and they will become even more intense. Eventually, mass civil unrest will cause the streets of many of our major cities to closely resemble war zones. When it is all said and done, this is not going to end well for any of us. The stunning police raid of Zuccotti Park at 1 AM on Tuesday morning made headlines around the world. Protesters were hauled off, tents were cut down and garbage trucks hauled off the personal possessions of those that had been encamped there. It was swift and it was brutal. But it was just another in a long line of raids that we have seen over the past couple of weeks. Occupy camps in Portland, Oakland, Chicago, San Francisco, Dallas, Atlanta and several other cities have also been raided. There is an increasing body of evidence that these raids have been coordinated. For example, Oakland Mayor Jean Quan recently made the following statement during a recent interview about the Occupy movement…. Does anyone want to guess who was running that conference call? Heidi Bogosian, the executive director of the National Lawyers Guild, is convinced that the recent raids were coordinated at the federal level…. Someone probably thought that cracking a few skulls and cutting up a few tents would probably make the hippies go away. Yes, that might have worked in 1991. But this is 2011. Whether you agree with Occupy Wall Street or not, one thing that should be clear to all of us is that these boys and girls are deadly serious. In response to the recent raids, organizers have declared “a national day of direct action” on Thursday. One of the “major actions” being planned is a “shut down” of Wall Street. Of course that will not happen because thousands of law enforcement personnel will be dispatched to protect Wall Street if necessary. But what does seem clear is that Occupy Wall Street seems determined to take things to the next level. In this video, a wild-eyed protester can be seen making the following statement…. Later on in the video, the same protester makes an even more inflammatory statement…. That is a very frightening statement. As I noted the other day, one recent survey found that 31 percent of all Occupy Wall Street protesters “would support violence to advance their agenda”. Let us hope that cooler heads prevail and that we don’t see outbreaks of violence. If we do see violence in the coming days, it will just give law enforcement authorities an excuse to crack down even harder. Up to this point, local law enforcement authorities have been advised to seek “legal reasons” for evicting Occupy protesters. Since just about everything is illegal in America today, that has not been too difficult. So far “zoning laws”, “curfew rules” and regulations that target homeless people have been used as justifications to evict Occupy protesters. In New York City, Mayor Bloomberg has said that protesters can gather in Zuccotti Park, but that “the rules” do not allow them to have tents, sleeping bags or any sort of heavy equipment. So will the protesters go along with this, or will this turn into a prolonged struggle over Zuccotti Park? It is hard to say, but one thing is for sure – police all over the nation have already shown that they are prepared to use brutal force against these protesters in order to get their way. We have seen tear gas used, we have seen pepper spray cannons used, we have seen rubber bullets used and we have seen flash-bang stun grenades used. And they are just warming up. When it comes to protecting “national security”, there is a vast array of technologies and weapons that law enforcement authorities have at their disposal. Many Americans are cheering the crackdown on these protesters, but we all should remember that real people are getting seriously injured. For example, just check out this photo of 84-year-old Dorli Rainey after pepper spray was blasted directly into her face. Rainey and several other Occupy Seattle protesters are still in the hospital. You can see video of a female Occupy Cal protester being brutally yanked by her hair right here. How would you feel if that was you? We all need to realize that these confrontations are not just a bunch of “fun and games”. A lot of people have been sent to the hospital already, and this is just the beginning. One of the key things that the American people will need to understand is that they don’t have to pick sides. When law enforcement authorities commit atrocities, we should denounce them. When Occupy Wall Street protesters commit acts of violence or vandalism, we should denounce them. It would be nice if all Occupy Wall Street protests would be 100% non-violent. It would be nice if the police would be reasonable and would carry out their duties with gentleness and respect. But sadly, those things are probably not going to happen. The civil unrest we are seeing now is only the beginning. If things keep getting escalated to “the next level”, eventually we will see martial law imposed in some of our largest cities. The United States is increasingly becoming a very unstable place. As America comes apart at the seams, this is not going to end well for any of us.